Christine Strichen (Wanganui East) won the Women's title for the second time. In the final, Christine beat Joanne Lippard (Herne Bay) by 19 points to 18. The Men's title was won by Georgio Vakauta (Vikings) for the fifth time. In the final, Georgio beat Bob Bridge (West End) 24 points to 22. 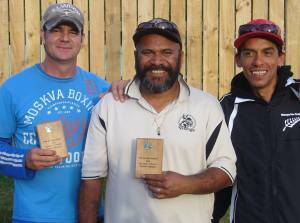 Defending champions, Allan Fletcher, Andre Noel and Georgio Vakauta won the 2011-12 Naional Triples Championship played at Kapiti. On the first day they dropped four points in their five games and easily topped the list of qualifiers. Things did not go quite as smoothly on the second day as they lost to Christian Fouquet, Lee Taffard and Dirk Winnie in the second game of the pool round. They were almost bundled out of the competition by Charles Brock, Neville Frost and Graeme Morris before they emerged with the win in the barrage game. In the final they gained revenge for their earlier loss as they outclassed Christian Fouquet, Lee Taffard and Dirk Winnie to win 13-2. (5-0, 5-0d, 8-0, 12-0, 12-2, 13-2). The unofficial PNZ Ranking list showing player seeding points has been updated following the National Triples. There are five Wellington players in the top 21. Auckland leads the list with eleven, Hawke's Bay has four and the South Island one. 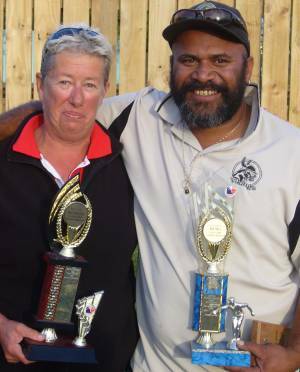 Bill Peachey (Hibiscus Coast) is the highest ranked Senior male and Shirley Selwyn (Wanganui East) is the highest ranked Senior female. Nominations for the 2011-12 WPA Regional Awards have opened. Details on the Awards and Nomination forms have been sent to all clubs. The closing date for nominations is 25 May. Nominations may be made by Clubs or Individuals. Wanganui East won the Jacques Cochonnet Trophy for the third time when they convincingly beat Park Avenue in their challenge match. Triples: Simon Grant/Tangi Rasmussen/Enoka Smiler vs. Sue Gurr/Tony Simpson/Richard Tufrey 1-13, 7-13, 12-13. The draw for Round 17 will be made at the WPA meeting on 19 April. New Zealand Has been invited to send two teams to the Pan Pacific Championship to be held in Sydney (15-17 June). Christian Fouquet (Herne Bay), Andre Noel (Vikings), Georgio Vakauta (Vikings) with John Targett (Christchurch) as coach. A fourth player for each team will be confirmed after the Trans-Tasman match. The inaugural Trans Tasman match was played in Melbourne in 2003 and was won by New Zealand. The following year, New Zealand hosted its first Trans Tasman match at Clareville after the Masterton Midwinter Doubles, with Australia gaining the upper hand. In 2005, a Senior match was held alongside the Trans Tasman which became known as the Open Trans Tasman. Played in Sydney, both matches were won by Australia. The 2006 match was held in Levin with New Zealand winning both sections. Back in Melbourne in 2007, Australia won both matches. In 2008, the Trans Tasman was held in Christchurch with the home side again winning both matches. Sydney was the venue for the 2009 Trans Tasman and New Zealand won both matches. In Auckland in 2010, New Zealand completed the three-peat and in 2011 in Melbourne, New Zealand won both matches for the fourth consecutive year. New Zealand has won six Open matches to Australia's three. In the Senior matches, New Zealand has won 5 to Australia's two. The tenth Trans Tasman match takes place at the Wanganui East club this coming weekend. Robin Anderson, Guy Bahler, Doreen Boudan, Delys Brady, Guy Detot, Clifford Edouard, Francois Hitie, Kate Mangan, Danielle Marchand, Libby Sowter, Grant Threadgate, Kim Threadgate. Joyce Anderson, Helen Bayet, Jean-Paul Boudan, Irene Callaghan, Adrian Clements, Terry Dando, Fayhe Hide, Valmai Nicholl, Robyn Ryan, Allan Sanderson, Antonio Stojsic, David Ward. The Australian coach is Warren Sowter and the Manager Jean-Paul Bowden. Sharon Cannon, Allan Fletcher, Pam Jenkins, Barbara Johnston, David Lippard, Joanne Lippard, Andre Noel, Michael Rocks, Christine Strichen, Richard Swaney, Georgio Vakauta, Claire Wilson. New Zealand Coaches are Selwyn Sainty (Open Women), John Targett (Open Men), Dirk Winnie (Senior). Lorraine Brock is the Manager. Christian Fouquet is the team captain. The start time is 8:30 am both days. Spectators are welcome. To win a Trans Tasman match, a team must achieve 61 match points. Each Triples game is worth 3 match points to the winner, and each Doubles game is worth 2 match points to the winner. In each round of games there are 12 match points available. At the end of the first day's play, New Zealand leads the Open match by 44 points to 16. In the Senior match, New Zealand is leading by 37 points to 23. New Zealand won the Trans Tasman match for the fifth consecutive year. In the Open section, New Zealand won 85-35 and in the Senior section, New Zealand won 75-45. 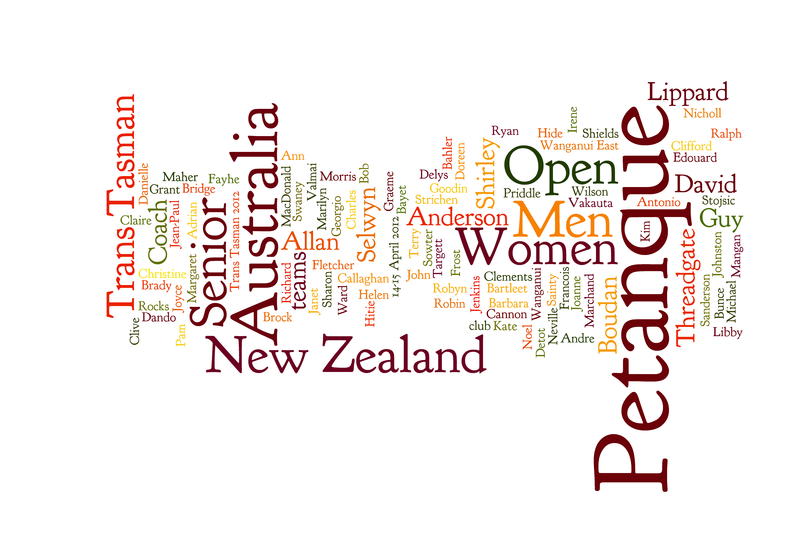 Michael Rocks created a T-Shirt based on the names of the players involved in the Trans Tasman match using Wordle. Due to changes in the Australian teams, the graphic has been updated in case anyone would like to have their own T-Shirt printed. 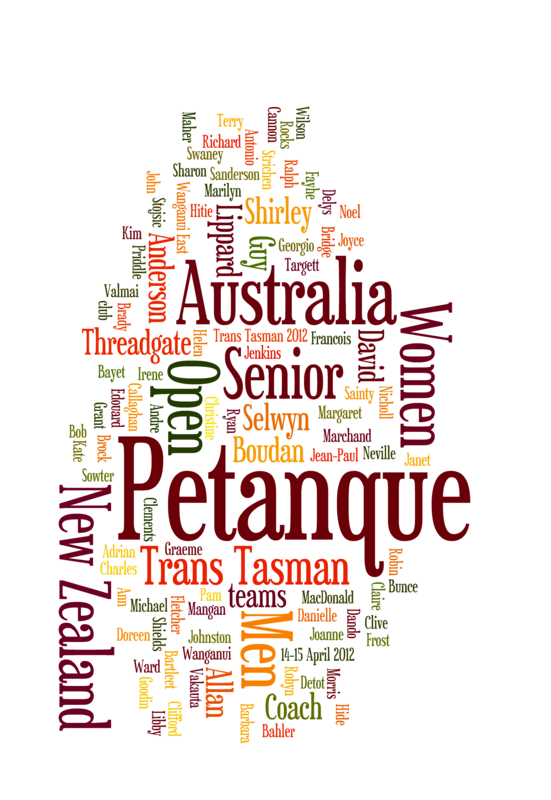 Twenty-four players have entered the Regional Women's Singles to be played at the Wanganui East Pétanque club on 22 April. Following the Trans Tasman match, the national selection panel of Selwyn Sainty, John Targett and Dirk Winnie have announced that David Lippard (Herne Bay) and Claire Wilson (Masterton) have been slected as the fourth player for the New Zealand Men's and Women's teams respectively. The Men's team of Christian Fouquet, David Lippard, Andre Noel and Georgio Vakauta will also represent New Zealand at the World Championships in Marseille, France in October. John Targett has been confirmed as the coach. The draw for Round 17 was conducted after the WPA Committee meeting. Wanganui East's first defence will be against Kapiti. Note: The venue is for the Challenger. Six countries took part in the inaugural Men's Confederations Cup tournament held in Antananarivo (Tana), Madagascar. France 13, Monaco 7; Laos 9, Thailand 12; Madagascar 13, New Calendonia 0. France 13, New Calendonia 5; Madagascar 13, Laos 8; Monaco 13, Thailand 9. France 3, Madagascar 11; Laos 1, Monaco 13; Thailand 13, New Calendonia 7. France 7, Thailand 13; Monaco 0, Madagascar 13; Laos 13, New Calendonia 12. France 13, Laos 7; Madagascar 10, Thailand 9; New Calendonia 4, Monaco 13. Claire Wilson (Masterton) won her first Regional Championship when she defeated Yvonne Futcher (Wanganui East) 13-9. The Plate final was won by Barbara Johnston 13-10 over Joan Miller and the Bowl was won by Lee-Anne Bird 13-11 over Josie Penton. Results from Day Three of the 2012 Inter-club competition are now available, along with the draw for the semi-finals.